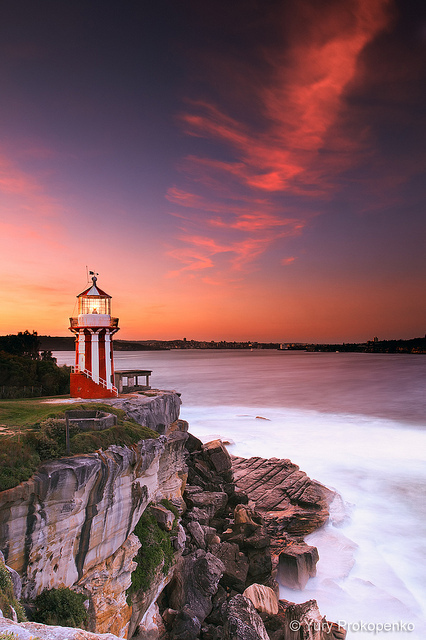 Hornby Lighthouse, also known as South Head Lower Light, is an active lighthouse located on the tip of South Head, New South Wales, Australia, a headland to the north of the suburb Watsons Bay. It marks the southern entrance to Port Jackson and Sydney Harbour, as well as lighting the South Reef, a ledge of submerged rocks. It is the third oldest lighthouse in New South Wales. The lighthouse is a tapered circular structure, built of curved dressed sandstone and standing 9.1 metres (30 ft) above the ground. It is painted with distinctive red and white vertical stripes. The sandstone was quarried locally. On top of the tower is a non ferrous metal balcony and railing, painted white, surrounded the glass enclosed lamp.